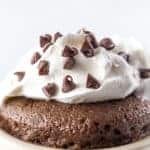 I love simple desserts. 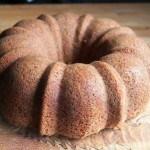 And this brown sugar bundt cake is a perfect example of a simple dessert. It gets it’s flavor from brown sugar, butter, and vanilla. That’s it. There’s no nuts or chocolate or dried fruit stealing the attention. And that’s what makes this bundt perfect. 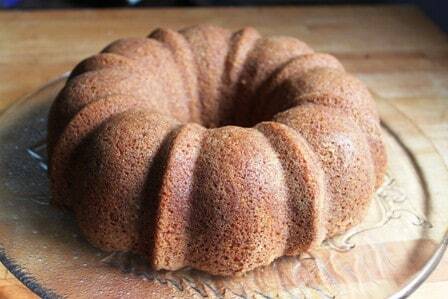 This simple bundt cake, which gets its main flavor from brown sugar, tastes lightly of molasses, vanilla, and butter. It's perfect with a cup of tea or coffee. Preheat oven to 350 degrees F. Grease a 10-cup bundt pan with non-stick cooking spray. Set aside. 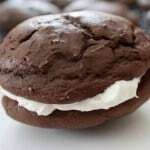 Whisk together white rice flour, cornstarch, sweet rice flour, baking powder, baking soda, xanthan gum, and salt. In the bowl of a stand mixer fitted with a paddle attachment, cream together the butter and sugar until it just begins to light. Add the eggs, one at a time. Scrape down the sides and bottom of the after the last addition and cream for an additional 30 seconds. Add 1/3 of the dry ingredients. Add until just blended. Add 1/2 the buttermilk and the vanilla. Cream until combined. Repeat with remaining dry ingredients and buttermilk. After adding the last addition of the dry ingredients, increase mixer speed to medium-high. Blend for 20 seconds. Batter should be fluffy. Spoon into prepared pan. Bake for 35-40 minutes or until a cake tester inserted into the cake comes out clean. Just finished making it for a birthday party. It stuck to the pan a non-stick AND well-buttered AND waited 5 minutes. 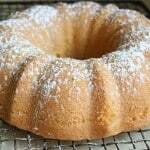 I’ve never had a gluten bundt cake do that…. That’s odd. I haven’t experienced an issue with the cake sticking. That can happen with a cake cools for too long in the pan. It doesn’t sound like you did that; so I’m not sure what caused the sticking. Glad it tasted good! Follow-up. The cake got a “thumbs up” for taste from the family!